Withycombe, last season's beaten Senior Vase semi finalists, have put the disappointment behind them and reached this year's Twickenham Final. After booking their place on Easter Saturday they have had to wait a fortnight to learn who they will face on the 7th May. Their opponents will be West Leeds, who beat the Midland's representatives Oundle 31-23 away from home. West Leeds are involved in a promotion battle in their league, Yorkshire Division Two, and currently head the table by 14 points and need seven points from their last three games to clinch the championship. The Senior Vase final will kick off at 1pm. Sadly the South West's other representatives in the RFU Cups, Matson and Widden Old Boys, were both knocked out in the National Semi Finals. Since the weekend before Christmas over 200 games have been postponed due to the weather, some more than once. The Western part of the South West Leagues has been worst affected and there are now 31 games scheduled for Easter Saturday, seven for Easter Monday and 14 on the last Saturday in April. Any further postponements involving clubs already playing on those days could well mean midweek fixtures being required. In addition the South West MAY have to prioritise fixtures and schedule those involving promotion and relegation ahead of other matches. Clubs who have been affected by the weather are encouraged to look at their remaining fixtures and see if any can be played midweek to free up Saturday dates for matches that involve more travelling for either team. If a game is to be moved to a midweek date, both clubs should email their agreement to the Admin Office and the details will be updated. Teams playing in the RFU Cup competitions have to have FIVE players capable of playing in the front row in a match squad of 22 players. Three in the starting XV and two others that might be called on should any of the original front row get injured or require to be replaced. We appreciate that the match result card supplied by the RFU has only space for four replacements, the names of the other three replacements can be included elsewhere on the card. Accompanied by family and friends, South West League Co-ordinating Secretary Mike Gee has been presented with his British Empire Medal in a ceremony in Truro. 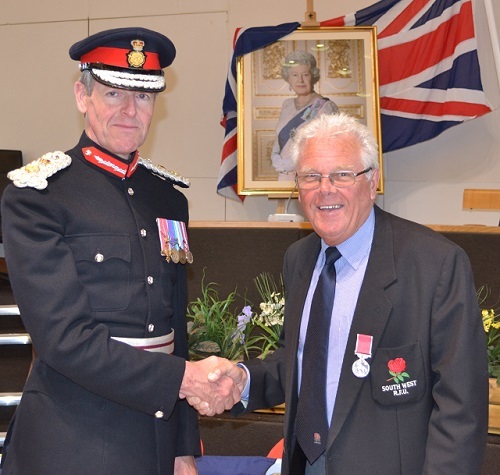 Mike was one of six from Cornwall who received their awards from the Lord-Lieutenant of the county Colonel Edward Bolitho OBE, himself a keen supporter of the Cornish Pirates. In the citation read out prior to Mike receiving his medal, his contribution to rugby for over half a century at club, county, regional and national level was outlined and met with warm applause. As well as receiving the award, Mike and his wife Louise, will attend a garden party at Buckingham Palace next summer. Cheltenham North have successfully applied to return to the South West Leagues from the start of Season 2016-2017. In accordance with the South West’s policy of giving a full season’s notice, we are writing to inform you that an extra relegation may be required at some, or all, levels from Level 7 down, at the end of the 2015/16 season. However, should they achieve promotion in 2015/16, they will play at Level 7 or, if they are relegated, they will come in at Level 9. It is not possible at this stage to be more specific. The RFU has been working to develop ways to make it easier for students to play for local rugby clubs and is introducing the Student Pass this season 2015-16 as a trial period. The Student Pass is intended to encourage students to play more rugby more regularly by introducing greater flexibility with the registration of players. This will enable genuine students to play for their home club and the club local to their higher/further education institution by undergoing a simplified and less onerous player registration process. Full details of the conditions are here. Full details of the registration process are here.